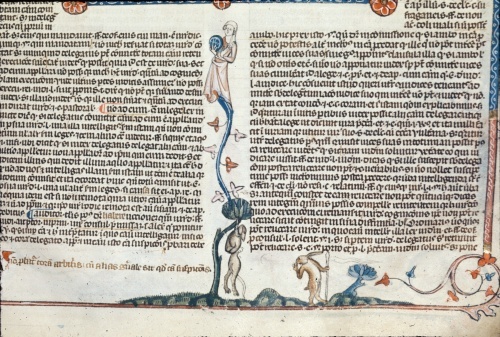 When you look through this 13th-century manuscript made for the Pope you see it's filled with giant killer bunnies, geese lynching wolves, and other crazy things. They are cute, silly, or a comment on Medieval daily life. But not all. This one pictures a dog hanging by its neck from a tree. The rabbit with his paw to his mouth casually shushes the dog. Even if the rabbit was a human why would 'he" do that? Perplexing. And there's more. The woman over the tree is looking into her mirror, a sign her looks are most important. The mirror shows she's vane. Vanity is prideful and "Pride" was one of the 7 Deadly Sins. So not exactly things you want to put on a scroll. What would they tell the recipient? They're mean or hate dogs. Lack respect. Think highly of their looks. There are cuter, sillier bas-de-page illuminations you can use in the Royal 10 E IV. There's also weirder ones, too. You'll find them in the manuscript's perplexing details.